Last December, a friend asked me how much I thought I spent on each child at Christmas. Later on, I did the maths, and realised that the amount was considerably higher than I’d boasted to my friend. I had no choice but to send her a grovelling text. 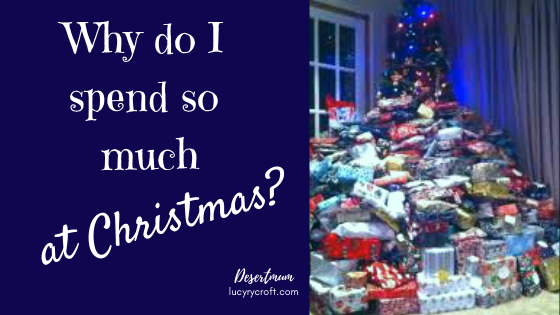 See, in my head, I want to be one of those people who is Terribly Frugal and Extremely Well-Budgeted at Christmas – but, in real life, I’m just not. My whole being screams out to be that someone who’s sharing petitions about plastic consumption on Facebook, while boasting proudly that all I’ve bought my kids this year is an ethically-made goatskin poncho and a traditional family board game to share together lovingly on Christmas Day. But I’m not kidding anyone. 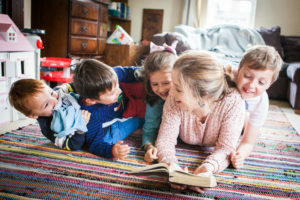 I don’t know whether you set a strict budget for your children’s presents, or have an upper limit, or whether you get them what they want regardless of what’s in the bank – but I’ve found myself guilty of being just a little too sanctimonious about the Very Sensible Amount I spend on my own children. Then we buy them something to wear (again, arguably, this is also something we would have got them anyway), and something to read. Books are two a penny these days – so at Christmas I like to find a slightly more ‘special’ book than I’d have bought otherwise – but obviously there is a premium when you’re buying a hardback, which is what ‘special’ often means. And then of course if you have a stocking tradition, which we do, the present budget gains an extra few pounds. Does anyone find it possible to fill a stocking on a budget without resorting to sweets or plastic tat which will break on Boxing Day? If you do, I’d love to hear from you. Instead, my strategy has been to fill them primarily with things they need – they get a few treats, but also flannels, underwear and new water bottles. The thing is, I’m justifying all of this to you now, but it all adds up – and it adds up to quite a lot, really. We’re not particularly extravagant – for example, my son’s choice of expensive games console has been brought down (with his permission) to something much cheaper which does the same job. And this will be a joint present from us, various relatives and friends, and some of his own savings. But I’m also aware that, if you compared me to most of the world, ‘extravagant’ wouldn’t even come close to a fair description of what I’m able to spend at Christmas. I could also try and justify myself by saying that we live a fairly simple life for the rest of the year – but again, does it count as ‘simple’ when you can afford to run a car and go on holiday? There are many families who will struggle to do even one of those things in 2019. You could hardly see her tree for all the presents – and she quickly became the ridicule of the nation when others started to attack her materialistic ethic (presumably while also buying their own fair share of unnecessary gifts). She responded by saying that she shopped through the year for things she thought her kids would like. She took advantage of sales and discounts to get good deals. Many of the presents were necessities like shower gel and shampoo. Her family was a large one, and had always ‘done presents’, so this was just part of their culture. Every now and then, this woman comes to mind, and I mull over what she said. Who am I to judge how she and her family do Christmas? Am I really in a position to point our her own errors in deferring to an overly-capitalist culture – or do I first need to look at my own errors, and see where my own buying does not reflect God’s priorities? Is it right that my response to this woman is “Thank God I’m not that bad”? Or that my response to the coming of our Saviour is to detract my children’s attention from His rescuing plan by giving them more Stuff? It’s always going to be a hard balance for parents. But one thing I’m learning: we’re not to judge how other people spend their money. God only calls us to give Him our wallets – not other people’s. The trouble is, my wallet has often gone AWOL.